Day 17: Make a timeline for one of your ancestors. Be sure to include major life events (birth, baptism, marriage, birth of children, death, burial, etc.) as well as information that’s come from year-specific directories and federal or state censuses. Visually mapping your ancestor’s life will help you identify gaps in your research as well as aid you in evaluating new information you might discover. Since I’ve just started to use TNG (privately for now) to look at my Unst tree, it produces a timeline for each person. Here’s one for the person I’d like to interview (see Day 18). I also have him located on all the census returns from 1841 through 1901, and his occupation recorded from various marriage records of his children which is not shown on this timeline that TNG produces (perhaps I can update it a bit once I learn more about how to modify TNG). Day 18: Identify a relative (living or dead) who you’d like to interview about your family’s history, and prepare a handful of questions you’d like to ask. You can use our list of interview questions as a starting point. 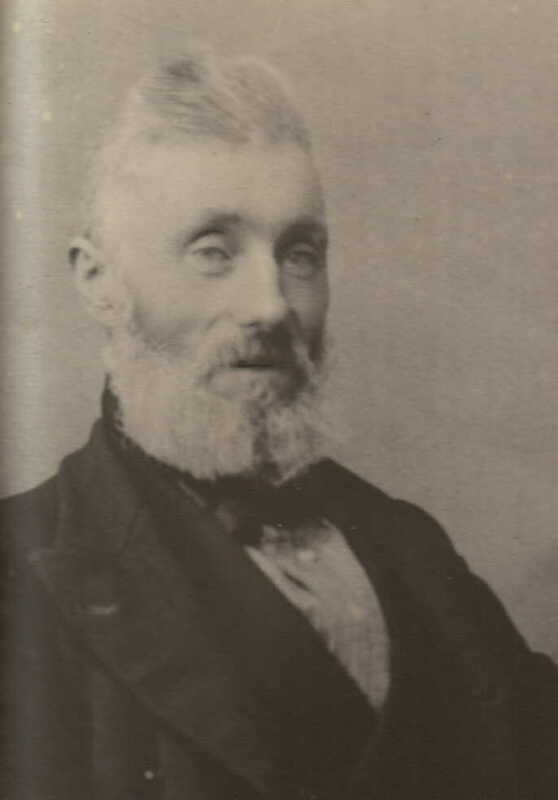 The relative I’d like to interview is my great great grandfather ‘Auld Erne’ (the sea eagle) John Hughson, who lived in Colvadale and was skipper of a sixereen. What was it like living in Colvadale? How does everyone fit into such small croft houses? How did you meet your wife, Jemima? Do you get tired of eating potatoes and kale? Is it scary fishing the far haaf in a storm? Day 19: Set up a time to interview a relative, and use your questions from yesterday’s prompt. 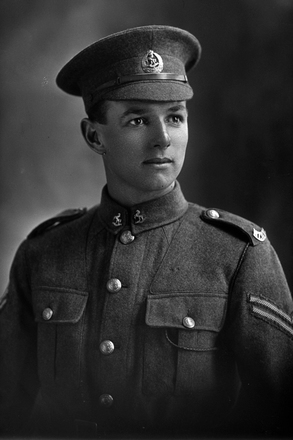 You never know what kind of family history information even a distant family member might have! Since I chose a relative that is no longer alive, I’m skipping this one. Day 20: Download the Surname Variants Chart worksheet from FamilyTreeMagazine.com and record all the variations you can think of for three surnames you’re currently working on. Do any previously unconsidered spellings pop up? Revisit online databases and search for any variants you haven’t tried before. There are quite a number of varied spellings for surnames that I have come across in my tree. Some are fairly repetitive and predictable, like, Johnston vs Johnson, and Jamieson vs Jameson, but some are a bit more interesting. Day 21: Find an ancestor in a federal census record and examine the other names on that ancestor’s census return page and on the page before and after it. Do you see any familiar names? Relatives often lived close together, and your ancestor may have been friends with (or even eventually married) a neighbor from down the street. Since I’m doing a family tree for the whole area of Unst, I do this as a matter of course. You do find people recorded on census with their neighbours, or siblings, and so on. Day 22: Preserve your own information for future genealogists. Write down the major events from your lifetime (your birth, graduation(s), marriage(s), major moves, military service, etc.) and store them in a safe place. Your descendants will be glad that you did! My birth and marriage were already in the tree, but I’ve now added schooling, university graduation, the two main “Starting Work” events, and my emigration to New Zealand. Day 23: Learn the basics of your immigrant ancestor’s language. You can consult word lists like the ones curated by FamilySearch. Focus on the names of family members (father, mother, child, brother, sister, son, daughter, etc.) and words likely to be used in records (birth/born, bride/groom, marriage/married, death/died, buried, etc.). My own ancestry, and that of the island I am studying, all comes from Unst in Shetland. I was brought up speaking the Shetland dialect, which does vary from place to place in Shetland. There is also a Shetland Dictionary, both in book form (I have one in the bookcase) and more recently online. 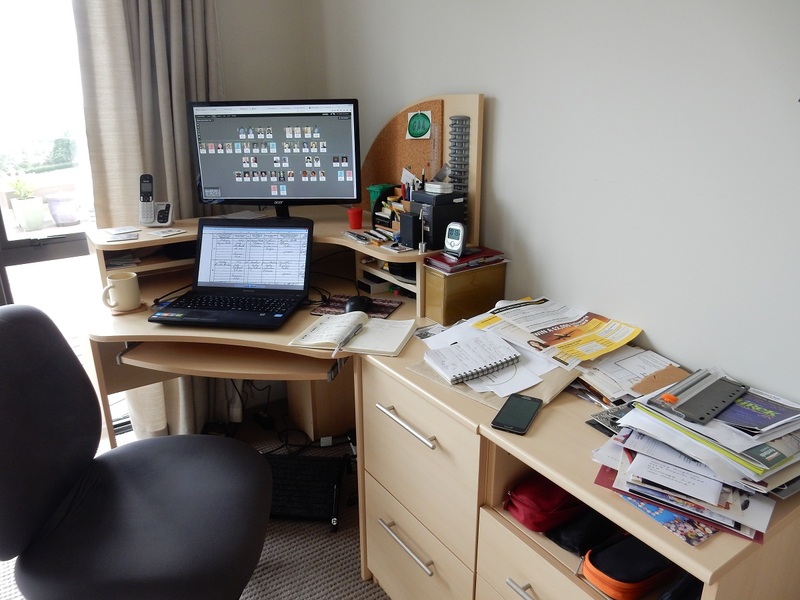 Day 24: Organize your desk. 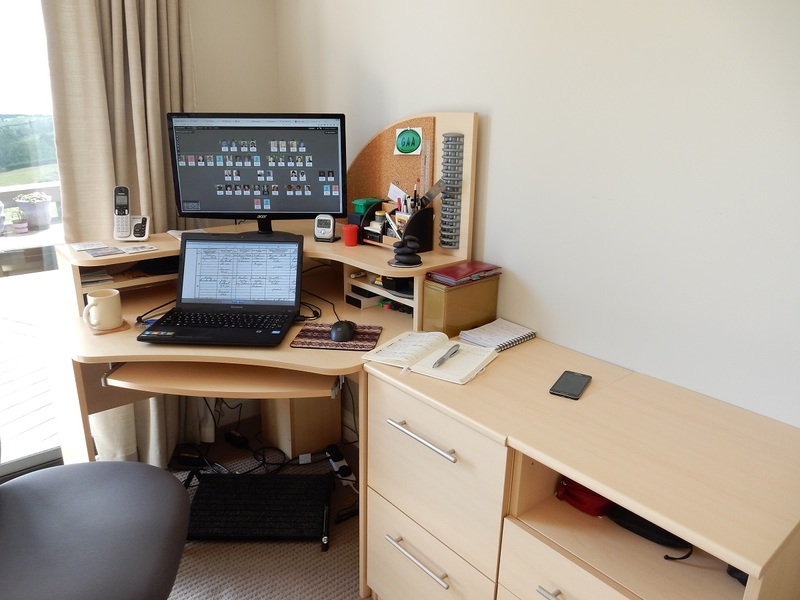 Clean, structured workplaces will help you be at your best and prevent you from distractions. Also be sure to organize your computer desktop or the apps on your tablet or smartphone. My desk has been this sort of cluttered for about a year. It doesn’t get any worse, but it doesn’t get any better either! There that’s better. Now I don’t need paper-weights when I open the window to let a breeze through! Day 1: Sync your desktop software and online family trees to make sure you have the latest version of your work in both places. If you don’t use desktop software, download a GEDCOM of your online tree instead. If you don’t have genealogy software or an online family tree, consider starting an online tree to help you organize your research. I don’t use desktop software but instead build my private tree on the Ancestry website. I do download GEDCOM copies of it in an ad hoc manner, when I think I’ve made a sufficient number of changes to warrant doing so. This had increased a little recently when I’ve been playing around with TNG, but I could do with a more regular pattern as well as the ad hoc extras. So since I’m starting a new month to improve my family history fitness, I’ll mark the beginning of the month as the time when I take a new GEDCOM copy. Day 2: Back up your genealogy data using an external hard drive or a cloud service. If you don’t currently use a backup system like Dropbox or Backblaze, take some time to learn about them. With my new regular export to GEDCOM I’m also going to use that to save it off to an external hard-drive too. If I do them both together I have more chance of achieving this as a regular step. Day 3: Create a source citation workflow so that you—and anyone who sees your research—will know where you got your information. Citations are one of my strong suits, and possibly the reason why it’s taking me so long to finish my work. Nothing goes into the tree without full transcriptions and source citations. Day 4: Set up a file-naming convention, and make sure all your documents follow it. This will simplify your filing and help you quickly find the information you need. Some of my documents follow a good scheme and some don’t. Census pages and any statutory records (post-1855) are well organised including the year in the naming scheme. Old Parish Records are much less organised and every time I need to browse a particular year it takes me a while to find it. So I’ve used this prompt as a nudge to get that sorted. Day 5: Find your local FamilySearch Center. Have you ever visited one? These branches of the Family History Library (FHL) have helpful volunteers, local resources, and computers with access to genealogy websites. From a FamilySearch Center, you can also rent microfilmed records from the FHL. Search for the nearest one, and call to check the hours. This is my nearest Family History Centre. It is open Monday, Tuesday and Thursday 9.30am -3.30pm. I haven’t been there yet, but I definitely want to go. Day 6: If you’ve taken a DNA test, look at your DNA matches (not just the ethnicity results) and review the match information for any fourth cousin or closer. Also check for messages from any matches who’ve contacted you (and respond to them). Since I haven’t taken a DNA test, I’ve skipped this day. After all there are more days in January than there are in February so in order to complete it in February I need to get cracking. Day 7: Choose a town your ancestors lived in and search the FamilySearch online catalog for it. Browse records the FHL has on microfilm and note any that might apply to your research. You might even find links to digitized versions on the FamilySearch website. 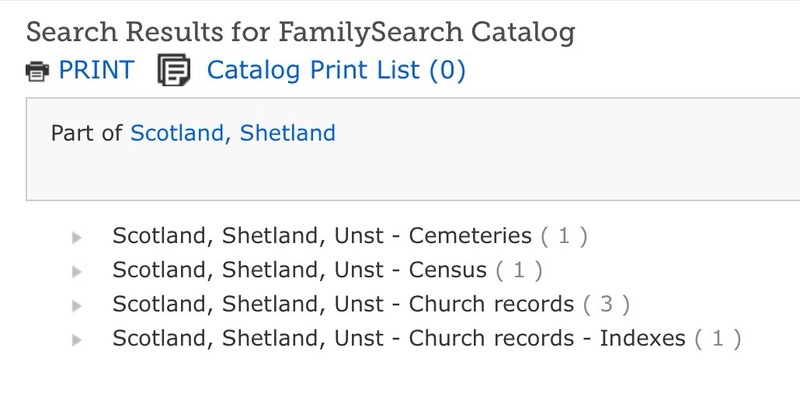 Searching the FamilySearch online catalog for Unst showed up a small number of records, but nothing that I hadn’t seen before. At least I know I’m not missing out on something major as a source! Day 8: Search a digitized newspaper collection for names on your family tree on the Library of Congress’ free Chronicling America website. The best digitised newspaper site for British research is of course the British Newspaper Archives. It has the Shetland Times, from 1872 onwards, digitised which I use in an ad hoc manner at the moment, with an intention to go through more thoroughly once I finish processing all the information I have already collected. It can also be used for free from the library which is nice. So that’s week 1 finished. I’m feeling fitter already, well better organised anyway!